Dr. Hull specializes in strategic public health communication research and practice. Her research focuses on the processes through which mediated messages affect social and individual determinants of health, especially in the context of HIV prevention. Dr. Hull’s work routinely involves collaborating across disciplines and communities. For example, she led the research behind the construction, implementation and evaluation a social marketing campaign to reduce HIV among gay men of color by affecting homophobia in the community. The campaign, called Acceptance Journeys, was designed to address homophobia and its impact on the HIV related risk experienced among young gay men of color. Dr. Hull is also co-investigator on a project to develop communication tools promotion PrEP to young gay men of color in Wisconsin. 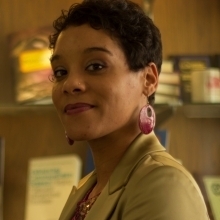 Dr. Hull’s CFAR funded work focuses PrEP promotion among women in the District of Columbia. This research aims to identify the psychosocial and environmental factors affecting PrEP uptake among Black women in DC and is conducted in collaboration with The Women’s Collective, a DC based organization that provides prevention, care and support services and advocates for the health of women and girls of color living with or at risk for HIV.